Are you stressed out at this point in the semester? 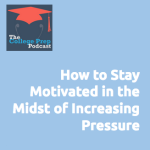 It’s hard to stay motivated in the face of increasing pressure, but it’s not impossible if you consider this checklist of motivation strategies. Look back at your routines and see if there is a key habit that you’ve let lapse. Pick it up again! Re-invigorate a team of supporters. Look for accountability partners. Get some new tools & supplies that will re-energize your work. Get organized! Take some time to clean out your backpack, desk, binders, etc. Break the overwhelming tasks down into bite-size parts. Take a conscious break (rather than frittering away your time unconsciously). Build play into your schedule. Recognize that you might need a mindset shift. Remind yourself of your goals & values, and how what you’re doing this semester connects to the bigger picture. Get affirmation from others. Give it to yourself. Notice if there is something you’ve outgrown (goals? friends? clubs? activities?) and be willing to let go of them.